Chemtrails are not to be confused with Contrails. Chemtrails look like contrails initially, but are much thicker, extend across the sky and are often laid down in varying patterns of Xs, tick-tack-toe grids, cross-hatched and parallel lines. 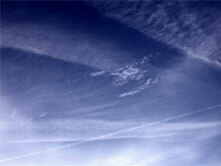 Instead of quickly dissipating, chemtrails expand and drip feathers and mare's tails. In 30 minutes or less, they open into wispy formations which join together, forming a thin white veil or a "fake cirrus-type cloud" that persists for hours. There are two types of chemtrail spraying said to be done: Low level and High level. 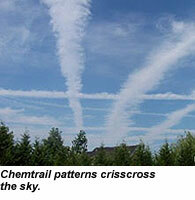 They are reported to cause a multitude of effects in our atmosphere and within all forms of life. There are few issues today that have sparked the controversy inspired by chemtrails. Many theorize that it is part of a clandestine operation to implement the New World Order (NWO) by eliminating society and the infirm and/or to reduce the population to a support level for the "elite". Originally, it was thought to be mass inoculation for possible bio-warfare attack; this theory has been ruled out with the increase of sicknesses and illnesses in the CT paths. It's a near-global event. 1. Weather modification, including global warming (the new cash-cow). Added to the magnetosphere allowing radiation to be transmitted at a frequency which excites electron cyclotron resonance to heat and accelerate the charged particles (HAARP). Blocks several modes of communication. Blocks T-cells activation, i.e., weakening the immune system. A chemical pesticide banned in 1983. Known as a carcinogen and chemical toxin. Has been named in 160 Pentagon patents pertaining to biological warfare and aerosol inoculation experiments. It is known to attack the respiratory system. Severe tissue damage and compromised immune system. Known as a DNA restriction enzyme that can create exotic viruses with specific characteristics and pathologies. 2. What in the Wolrd are they Spraying?